Here's a happy guy -- it's our Laughing Garden Gnome! Colorfully decked out in a red tunic, green pants, blue pointy gnome hat, brown boots and flowing white beard, this is a garden gnome who's about to bust right open with a hearty belly laugh. You and your family might have a harder time containing yourself once you have a look at him, and why even try? This little guy will bring his positive energy to any indoor or outdoor location. Outdoors, he can be placed next to the front door, in the yard or on a patio where friends gather. His weather-resistant cast stone material will hold up in the colder months. For an interesting twist, try him in a formal living room for a touch of unexpected whimsy. His compact size, 15 inches by 9 inches by 7 inches, makes him ideal even on a smaller porch or in a foyer. 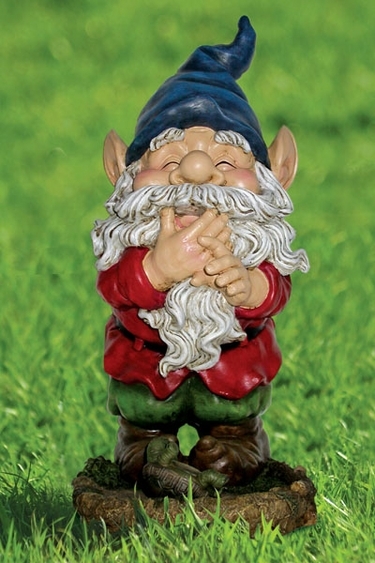 Enjoy our laughing gnomes, and spread the good cheer with unique garden gifts. Weather-Resistant Cast Stone Resin: 9" x 7" x 15"